Warm and hearty chowder recipes are easy to make and definitely fill our bellies with warm comfort. 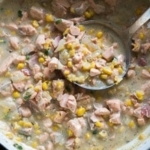 This salmon and corn recipe is filled with delicious chunks of fresh salmon, sweet kernals of corn, all merged together into a pot of warm goodness. Quick, simple and delicious, this salmon chowder recipe is perfect to serve over a cold winter day when you’re craving seafood. Creamy but not too rich, this simple seafood chowder recipe can be made with not just salmon, but any seafood that you like. In fact, it’s one of the easiest seafood recipes to make when you’re in a hurry to put dinner on the table. Measure out all the ingredients the day ahead and when you arrive at home, you just need to cook it all up and in less than 30 minutes you have a great chowder dinner on the table. 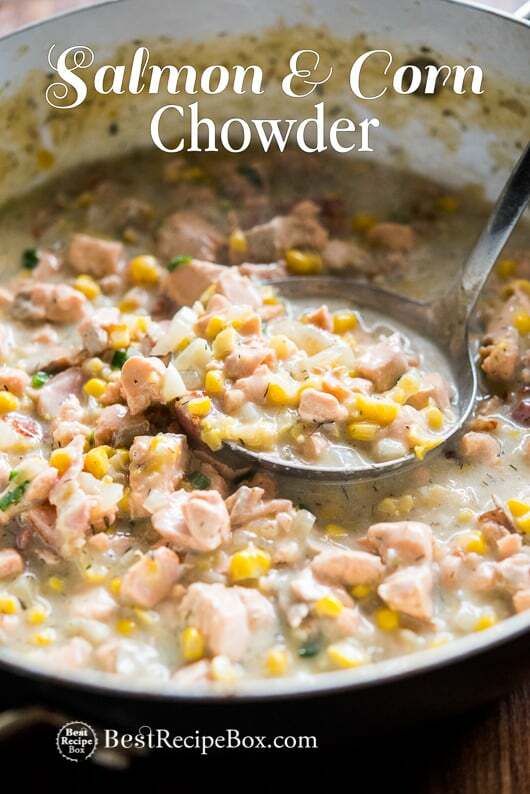 This chowder recipe can go beyond the salmon and corn. 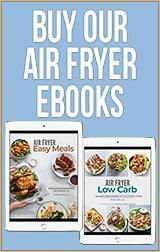 You can add potatoes, other vegetables or even more corn. 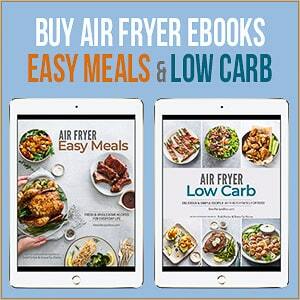 Don’t forget to add some crispy crackers or a good loaf of bread. Between the bread and salmon chowder, you have all four food groups in one great meal. 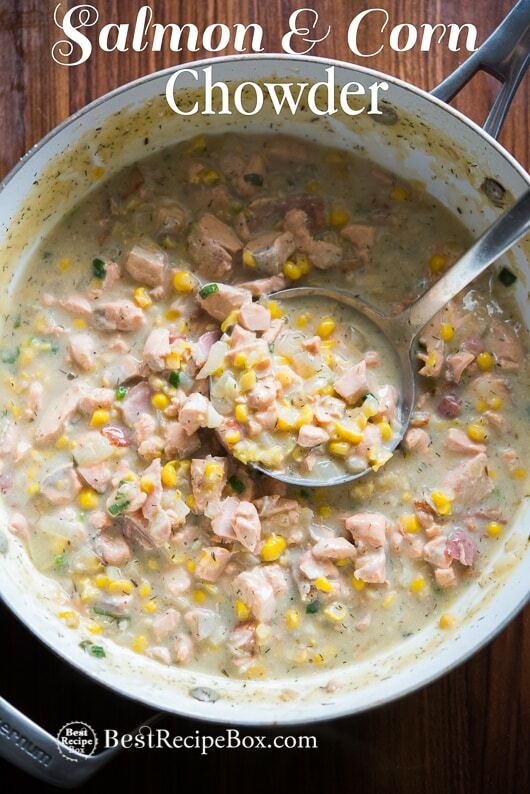 If you prefer not to use salmon or seafood, you can definitely just add more corn! 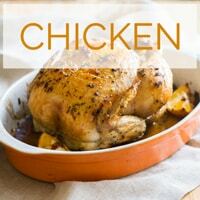 Replacing the seafood with some roast chicken is great too and it becomes an equally delicious chicken and corn chowder. 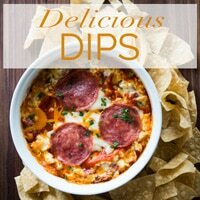 There’s so many possibilities to this recipe, make it your own and enjoy! 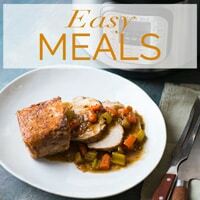 More great recipes you might enjoy: Soup and Stew Recipes, Slow Cooker Recipes, Easy Salmon with Teriyaki Glaze. 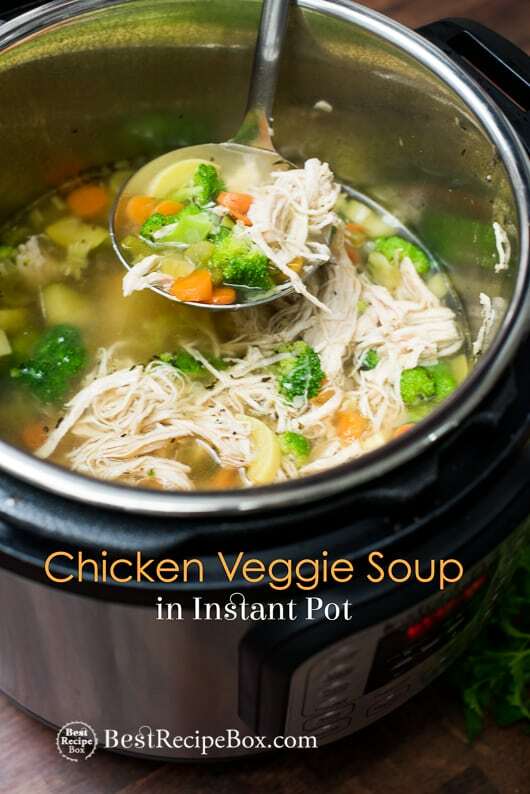 Our Instant Pot Chicken Veggie Soup recipe is a reader favorite because it’s super easy and quick to make. 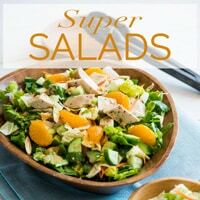 This recipe was originally published in 2016 and re-published in 2017 with a newer video. For a richer soup, substitute cream for the half & half in the recipe. 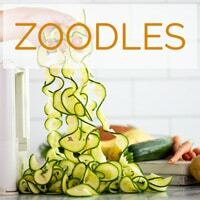 See post above for additional recipe details. Rinse and pat dry the salmon. Cut into bite sized pieces and set aside. Heat pot on medium-high heat. Add bacon and cook until golden brown, stirring occasionally. Add onion and garlic. Cook until soft and translucent, about 2 minutes. Add chicken stock, dill, thyme, Worcestershire sauce, corn, potatoes and half & half. Bring to a gentle simmer and then cook on low heat for about 10 minutes. Add salmon and cook on low-medium heat for 10-15 minutes, or until salmon is cooked through and chowder begins to thicken. Add the green onions and if needed, season with salt and pepper to taste. Add your toppings. Serve warm.